MY LATEST FIELD TRIP ….. PETSMART? I was in Petsmart this week, picking up the items from the list that my cat, Pearl, had given me. 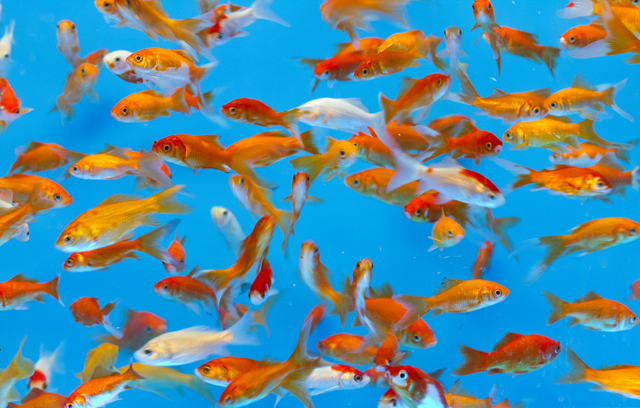 On the way out I was struck by this collection of brightly colored goldfish swarming about in their tank. With the manager’s permission I returned the next day to see what I could capture. It wasn’t easy. The relatively low light level required a slow shutter speed, even at a high “film” speed, and they were not considerate enough to pose. Oh, well. It’s not another snow scene, and it was fun and a good exercise. Ralph, I think you did good considering the conditions. Very colorful. What does Pearl think?? What did your cat think of your picture? Thanks, Gene Ann. You should be my agent. A good idea! I like it and nice bright complementary colors. Looks like goldfish wallpaper. Thanks, Denise. That a lot of them are headed in different directions suggests the frenetic motion that originally caught my eye. Should have shot some video, too, but I’m not yet thinking automatically about the 7D’s video.